On August 5th, 1894, Ranald MacDonald suddenly fell ill and died while visiting a favorite niece in an isolated area of eastern Washington, only a few miles from Canada. 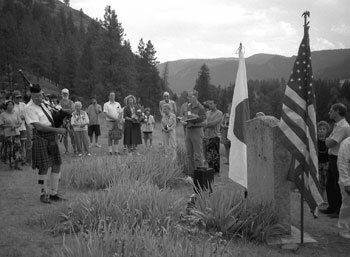 He was seventy years old, and his last words, reportedly spoken as she held him in her arms, were "Sayonara, my dear, sayonara..."
One hundred years later, on August 12, 1994, I attended a small ceremony at MacDonald's gravesite nearby, to commemorate his contribution to U.S.- Japan relations. Others present included the Friends of MacDonald society, some of his descendants, local residents, members of the local Colville Indian tribe, and a representative from the Japanese consulate in Seattle. A kilt-clad bagpipe player performed a Scottish lament, and its notes reverberated mournfully in the beautiful surrounding valley. Short speeches were made, a prayer was read, and then a few rocks from Japan's Rishiri island were placed on MacDonald's tombstone. Until a few years prior to that, I had never heard of Ranald MacDonald. While doing research on early U.S.-Japanese contacts, however, I came across his account of his adventures, published posthumously in a 1923 book issued by the Eastern Washington State Historical Society. Ranald MacDonald, The Narrative of His Life, 1824-1894, it forced me to rethink my understanding of written history, and of the accomplishments of those who often fall through its cracks. Who was Ranald MacDonald? Of no relation to the hamburger chain of a similar-sounding name, he was born in 1824 in the area of what is now Astoria, Oregon. The son of a Chinook Indian princess and a prominent Scottish official in the Hudson's Bay company in the area, he grew up in the rich natural and cultural environment of the early nineteenth century Pacific Northwest— a place where Native American, British, French Canadian, U.S., Russian, Hawaiian, and even Japanese culture intersected. In the early nineteenth century, more and more American ships began whaling in the Pacific, and they sometimes picked up hapless Japanese fishermen on disabled boats adrift at sea. Since Japan's strict policy of isolation at the time not only kept out most foreigners but banned the return of Japanese who left, most of these poor souls were unable to return home. A few castaways drifted all the way to the shores of North America on the "Japan current," which sweeps by the coast of Japan, across the northern Pacific and down the west coast of North America. In 1834, after seventeen months at sea, three surviving crewmen (Otokichi, Iwakichi, and Kyuukichi, who would bcome known as the "three kichis"because their names all ended with "kichi"), washed up on the shores of northwest Washington. After being taken captive by local Indians, they were freed to a Hudson's Bay Company sea captain. Sent to England and then China, they made abortive attempts to return to Japan, but wound up living out their lives in Singapore and Macao. Their odyssey made a deep impression on many people, especially in the Northwest, and MacDonald was one of them. There is no evidence that MacDonald personally met the Japanese castaways, but he heard many stories about them, and about Japan. As with many half-breed children of ranking Hudson's Bay officials at the time, MacDonald was sent back east to school, and later, following the wishes of his father, he found employment as a bank clerk. A restless, adventuresome sort, however, he soon quit, and— as outlandish as it must have seemed at the time— got the idea of going to Japan into his head. As he writes in his account, "...Japan was our next neighbor across the way— only the placid sea, the Pacific, between us." Perhaps because he also felt a racial affinity with what he heard about the Japanese, he came to believe that Japan was the "land of his ancestors" (a remarkably ahead-of-his-time idea given that Native Americans are now believed to have come from Asia). Although he certainly knew of Japan's draconian isolationist policies, he resolved to go there to become an interpreter and teacher, apparently believing he could someday make his fame and fortune when Japan eventually opened to the world. In 1845, MacDonald signed on as a crew member with an American whaling ship named the Plymouth, out of Sag Harbor, New York. After many adventures around the world, on June 27th, 1848 he persuaded the ship's captain to set him adrift in a tiny boat off the coast of Hokkaido, or Japan's most northernmost island, which was then one of the most popular American whaling sites. The other crew members were reluctant to let him go, and some even wept as he took off. Like most sailors at the time, they were well aware that unauthorized foreigners who set foot on Japanese soil— even shipwrecked sailors— risked execution. To them, it must have seemed as though MacDonald was sailing into the jaws of death. In fact, when a rudder from his boat was later found floating in the area by a different ship, and reported in North America, he was believed by many— including his own father— to have died. I have often tried to put what MacDonald attempted into a modern context, and found it difficult. For the privilege of being let off his ship in a tiny boat on the open sea, he reportedly paid nearly $2,000, a considerable fortune in those days. And it was in a area where waves can be rough and water bone-chillingly cold, even in summer; at a time when going to sea in any ship was to risk death from storms, starvation, and disease. And, at 24 years old, he was attempting to do something that seasoned American diplomats, heavily financed gift-bearing expeditions, and even armed warships, had been unable to do—- to visit Japan. MacDonald first sailed to a tiny deserted island in the area, and spent three nights there, plotting his approach. Hoping to allay the fears of the Japanese that he was trying to invade their territory, and to instead elicit their compassion, he decided he would feign distress. He practised capsizing his boat, and in the process lost his rudder (the one later found). Then on July 1st, he sailed towards Rishiri island, which stands out dramatically in the area with its Mt. Fuji-like snow-covered peak. Near Rishiri he again upset his boat and this time lost most of his effects, including his pistols. Unintentionally, he also fell overboard once. He spent the night, in what must have been depressingly chilly conditions, offshore. Then, at dawn on the 2nd, he saw men come out from Rishiri in boats, and performed his act of distress. As it turned out, his "rescuers" were not Japanese, but Japan's aboriginal race of Ainu, and they took him to the village of Nozuka, in a rocky shored-area of Rishiri. They treated him kindly, but he was eventually reported to the samurai stationed at Soya, near what is today the modern city of Wakanai, at the northern tip of Hokkaido. Eventually he was shipped to Soya, interrogated, examined, and incarcerated. From there he was transported by junk along the coast to Matsumae, in southern Hokkaido, and then south all the way to Nagasaki. In Nagasaki, the only port where the Japanese government permitted limited trade with the Dutch and Portuguese, MacDonald was again examined and interrogated, and forced to step on an image of the Virgin Mary and child to make certain he was not a proselytizing Catholic (as a Protestant, this gave him no particular problem). Then he was confined— imprisoned— in a room seven feet by nine feet. There were several other American sailors imprisoned in Nagasaki at the same time. Deserters from the whaler, Lagoda, who had landed in Japan, they were a rough lot who quarreled constantly and made repeated escape attempts. Their treatment correspondingly became quite rough, and two of them perished in captivity. MacDonald, however, seemed to make friends with all he met, and he was well fed and tended. He indicates in his account that the Japanese may have sensed a racial affinity with him, but more likely they were impressed by his innate charisma and intelligence. Having grown up in a multi-cultural environment and traveled the world, he was at home among peoples of different races and classes, and he had come to Japan peacefully and of his own volition. Moreover, he had a talent for foreign languages. Although it was forbidden for him to do so, he made a small dictionary that survives to this day. Some of MacDonald's captors realized what a valuable asset they had. In order to conduct trade with the few Dutch and Portuguese ships allowed to visit Nagasaki, a contingent of professional interpreters resided there. But with American and British influence in the outside world growing greater and greater, several interpreters realized the need to also learn English. MacDonald therefore became their teacher, and regularly taught a group of fourteen of them. They were lucky, for he was very well-read, in an age when most American sailors were illiterate. Of the interpreters, Einosuke Moriyama became a fast friend, and later played an important role in negotiations with Commodore Perry when he forcefully ended Japan's isolation in 1853. On April 26th, 1849, after a total of ten months in Japan, MacDonald was finally released to an American warship which had approached Nagasaki to retrieve the Lagoda deserters (and must have been surprised to find MacDonald). Far from feeling bitter, he regretted leaving. As he wrote later, of all the peoples he had met in his travels, both civilized and uncivilized, "there are none to whom I feel more kindly— more grateful—than my old hosts of Japan; none whom I esteem more highly." Why did MacDonald— the first American to voluntarily spend time in Japan— not become as famous as Commodore Perry or other early visitors? He certainly had the right qualities— today he would be a candidate for a Hollywood film. An acquaintance, Eleanor Haskins Holly, who met him several times shortly before he died, remarked even then on his youthful appearance, his "size and dignity," and his "erect bearing and strong vigorous appearance." Elizabeth B. Custer— the widow of the ill-fated General George Custer and someone hardly sympathetic to Native Americans— wrote about him in Harper's magazine in 1890, and even she was impressed by his eloquence, wit, and charm. Unfortunately for MacDonald's place in history, he did not return home right away. Ever the adventurer, after Japan he spent time mining in the gold fields of Ballarat, Australia, sailed to Europe, and eventually returned to North America around 1853. By that time news on Japan was dominated by Commodore Perry's expedition. Americans were fascinated by Japan, but like today, the fascination waxed and waned rapidly. When the Civil War started it was probably the last thing on their minds. Ranald MacDonald kept notes of his Japan adventure, and had a manuscript, but it was not published until 1923, nearly thirty years after his death. Working as an explorer, guide, and miner in the Northwest, he was far removed from centers of publishing, both physically and culturally, and as an exotic "half-breed," many in white society may not have taken him very seriously. In recent years, a grassroots movement has emerged in Japan and the U.S. to increase recognition of Ranald MacDonald. Monuments have been erected in Astoria and on Rishiri island, and in 1990 the Oregon Historical Society Press republished the long-out-of-print 1923 book on him. Much of this was thanks to the unflagging efforts of people fascinated by MacDonald's story, especially in modern Astoria and Portland, Oregon. Thanks to them, in 1988 the Friends of MacDonald society was formed, and today it has over 200 members world-wide. In the summer of 2003, after twelve years of research and writing, my book on Ranald MacDOnald and his complex story was finally published. To me, and to many others, MacDonald will always be a true hero, for his vision, his humanity, and his courage in attempting the "impossible." [Most of the above text was adapted from "Ranald MacDonald,An Early American Adventurer in Japan,” an article written for the May/June, 1995 issue of Japan Related magazine]. Schodt, Frederik L. Native American in the Land of the Shogun: Ranald MacDonald and the Opening of Japan. Berkeley, California: Stone Bridge Press, 2003. Schodt, Frederik L. America and the Four Japans: Friend, Foe, Model, Mirror. Berkeley, Stone Bridge Press, 1993. Schodt, Frederik L. "Ranald MacDonald,An Early American Adventurer in Japan.”Japan Related,(May/June 1995)no. 12,pp.39-42. Lewis, William S. and Murakami, Naojiro, ed. Ranald MacDonald: The Narrative of his early life on the Columbia under the Hudson's Bay Company's regime; of his experiences in the Pacific Whale Fishery; and of his great Adventure to Japan; with a sketch of his later life on the Western Frontier, 1824-1894. Portland, Oregon: The Oregon Historical Society, 1993 [reprint of 1923 edition with new foreword and afterword]. The original is now viewable on line, courtesy of the Washington State library. Nichols, Marie Leona. 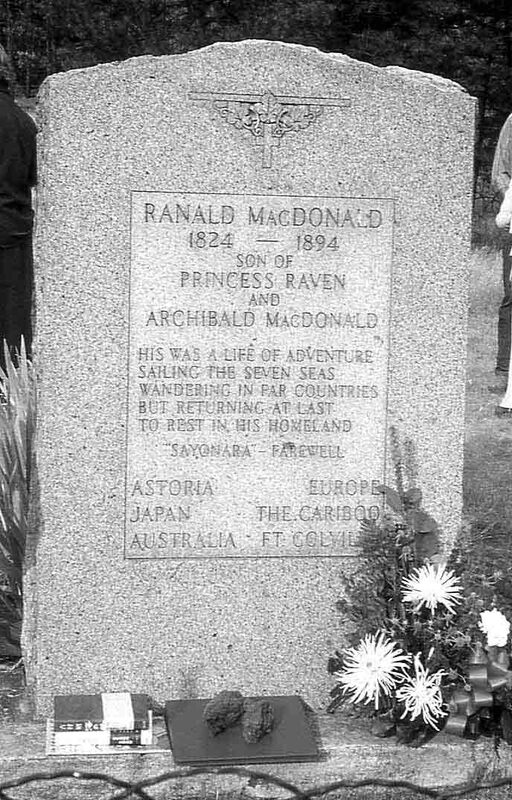 Ranald MacDonald, Adventurer. Caldwell, Idaho: The Caxton Printers, Ltd., 1940. Dye, Eva Emery. McDonald of Oregon; a tale of two shores. Chicago: A. C. McClurg & Co., 1906. Tsukimori, Atsumi and King, Mariko. Unsung Hero: Ranald MacDonald Story, True Adventure of an American Man. Also, the Friends of MacDonald website is a wonderful source of further information. And most recently, the wonderful "Friends of MacDonald: The Dutch Connection", sponsors of the Ranald MacDonald Award, has information in English, as well as in Dutch. Imanishi, Yuko. Ranarudo Makudonarudo: sakokuka no nihon ni mitsunyuukoku shi, nihon de saisho no eigo kyoushi to natta amerikajin no monogatari [Ranald MacDonald: Story of the American who snuck into Japan when it was still secluded from the outside world, and became Japan's first English teacher]	『ラナルド・マクドナルド 鎖国下の日本に密入国し、日本で最初の英語教師となったアメリカ人の物語』 今西 佑子 (著). (Tokyo: Bungeisha, 2013). Niki, Katsuji. 'Touyouno yu-topia' ni akogarete--Nihonhatsu no eigokyoushi[With longings to "utopia of the East'--The first teacher of English in Japan. 『東洋のユートピア」に憧れて―日本初の英語教師』--仁木 勝治 (著). (Hachijoji: Musashino Shobou, 2013). Miura, Ayako; Katsuma, Toshio; Katsuma, Kazue; et al. Manga Kairei--3kichi hyouryuumonogatari [Manga Kairei: Story of the 'Three Kichi' drifters]. 『漫画海嶺 ~3吉漂流物語』--三浦 綾子 原作 (その他), 勝間 としを 作画 (その他), かつまかずえ 構成 (その他). (Tokyo: Inochi no kotobasha, 2017).--- (While not directly about Ranald MacDonald, this is an interesting manga version of the famous novel Kairei, by Christian writer Ayako Miura, about the "Three Kichis," the three Japanese castaways who figure in the background of Ranald's story.In reality, Ranald never met them, but in this manga, in Ft. Vancouver young Ranald makes a cameo appearance in one panel). Native American in the Land of the Shogun: Ranald MacDonald and the Opening of Japan was published by the intrepid Stone Bridge Press, of Berkeley, California, in 2003. It was named one of the outstanding academic titles of 2004 by Choice: Current Reviews for Academic Libraries (published by the American Library Association). Press release here. It is available for order through finer bookstores (please also ask them to stock it), as well as onAmazon, Barnes and Noble, Powell's Books, and other on-line retailers. It is also available as an ebook on the Amazon Kindle platforms for PC, Macs, and tablets. "In 1848, against all odds, a half-Chinook, half-Scot man named Ranald MacDonald entered feudal Japan — when it was still closed to the outside world. Here is the true story of how this remarkable twenty-four year old journeyed on his own to a forbidden land and helped open it to the modern world. Frederik L. Schodt's fascinating history documents MacDonald's early years in the Pacific Northwest as the oldest son of a Hudson's Bay Company chief factor, his education at the Red River settlement in central Canada, and his employment in St. Thomas, Ontario. It then tracks his going to sea in the New England whaling fleet and his stopover in Hawaii, where he prepared his adventure to Japan. Ranald MacDonald marooned himself in northern Japan and was promptly arrested. From original records, Schodt tracks MacDonald's movements through Japan — his encounter with the indigenous Ainu, his capture by the local authorities, and his seven-month incarceration in Nagasaki. Far from being a passive detainee, MacDonald charmed his guards, intrigued his interrogators, and transcribed the Japanese language he learned. MacDonald taught English to the interpreters of a nation under increasing pressure from the outside world. His students used the knowledge he gave them, and later served Japan well when it had to negotiate with English-speaking foreign visitors, including Commodore Perry when he arrived on his "Black Ships" in 1853. MacDonald helped "crack the seal" on Japan. He gave American officials hints on how to impress the Japanese, and equipped Japanese officials with tools for understanding the intruders. His life was, and is, a bridge between wildly different cultures, races, and eras. He gave American officials hints on how to impress the Japanese, and equipped Japanese officials with tools for understanding the intruders. His life was, and is, a bridge between wildly different cultures, races, and eras. Drawing richly on primary source materials in Japan, Canada, Hawaii, and the Pacific Northwest, Schodt reveals a man of rare courage and daring, while laying to rest the romantic myths that have built up around the MacDonald story. With 53 illustrations, 7 maps, a bibliography, notes, and index, this book is a detailed and valuable contribution to our understanding of early globalization. Jacket design by Linda Ronan, incorporating a photograph of the Ranald MacDonald monument in Nagasaki, background images of the text of his deposition there, and a side bar with the logo of the Chinook tribe of Native Americans, along with the Japan's Tokugawa Shogunate's emblem. 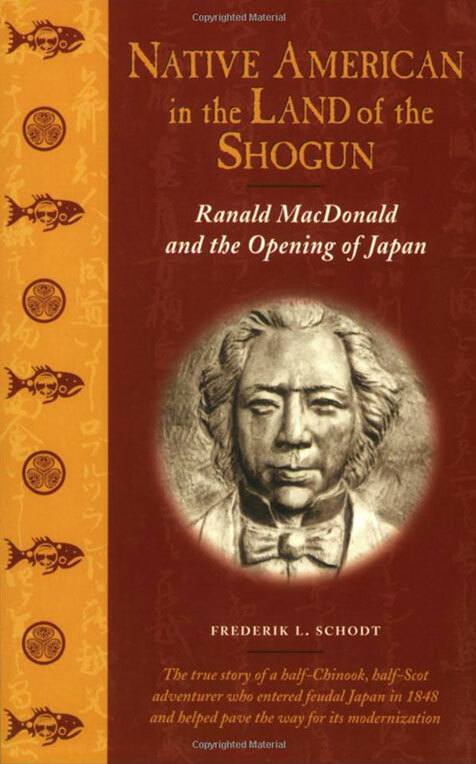 "A story that reads like fiction. . . . [Schodt] is particularly well-qualified to discuss Japanese perspectives on MacDonald's story and has uncovered material hitherto untouched by writers on the subject. This is certainly the definitive work on Ranald MacDonald." — Jean Murray Cole, author of This Blessed Wilderness and Exile in the Wilderness: The Biography of Chief Factor Archibald McDonald 1790-1853. English Wikipedia entry on Ranald MacDonald Society. 1849 Deposition of Ranald MacDonald at State of Washington library Site. Fred Dijs website tracing MacDonald's footsteps. Ralph P. Edgerton's 1969 article,"Ranald MacDonald (1824-1894), Adventurer," on the Washington State History "HistoryLink.org" site.